Don't be confused, it's not Dean Martin crooning 'Please don't talk about me when I'm gone'. Rather, it's about recalling the nasal tone of your strict headmaster who'd keep repeating the same few words, 'Please don't talk'. Because Hungerford Street's new eatery will legit take you back to school. The fam or bae would do okay here, but the place is truly fitting for your loud, crazy gang. School was all about being naughty and rowdy and your squad still does the same in almost all places. 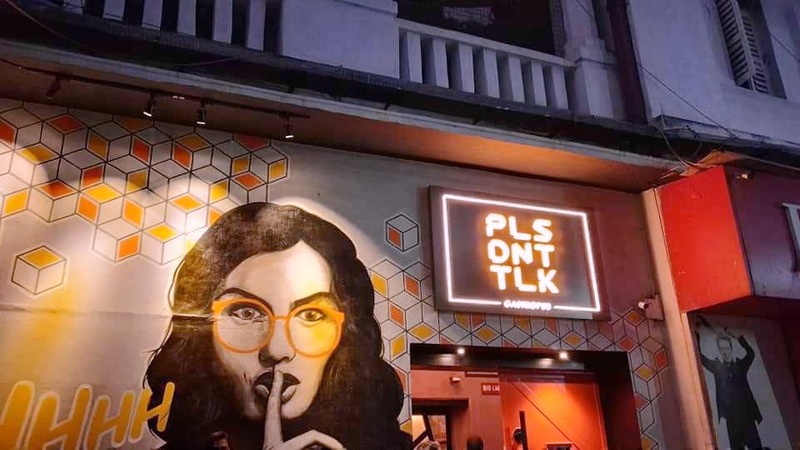 And when Plz Dnt Talk is taking you back to school with its faux library, huge chalk board, a glowing notice board, the smoking zone infirmary and wait staff in school uniform, why not add some noise and laughter to heighten the feel. The decor of the place (done up by city artist Jit Chowdhury) deserves a special mention, because half of the fun lies in just indulging in the curious little bits of school that we miss so much. Sit in one of the outside booths by Pink Floyd's 'Another Brick In The Wall' graffiti or head in the shisha zone and block up the tables by the bookshelves, you're sure to have a hella time sipping on molecular gastronomy inspired drinks (go back to chem lab with it) and nibbling on a mix of cuisines here. We loved sipping on Tea Blue as much as we loved watching the lemonade turn blue in the beaker. We munched on their tasty hargao and on the signature baos. There are noodles and rice bowls to scarf on if hunger comes trolling to your tummy. Alcohol is still not available, but there's a huge bar that promises to practice the best of alcohology. For shots and giggles, every table comes topped with childhood faves of peppermint cigarettes and origami papers that you can use to make the paper planes we so loved throwing at each other. The place is dimly lit, so not great for photographs. Also, network legit drags in the guts of this place. Meal for two would set you back by INR 1,200 (approx.) here.